AquaBlok® is a patented, composite-aggregate technology resembling small stones and typically comprised of a dense aggregate core, clay or clay-sized materials, and polymers. For typical freshwater product formulations, AquaBlok’s clay (sealant) component consists largely of bentonite clay. However, other clay minerals or clay-sized materials can be incorporated to meet project-specific needs, including product use in marine environments. Other technology parameters (particle size, relative clay content, etc.) can also be modified as appropriate. AquaBlok particles expand and self-compact when hydrated, with the degree of net vertical expansion determined largely by the formulation, application thickness and salinity of the hydrating water. When a mass of particles is hydrated, the mass transforms into a continuous and relatively plastic body of material. Once developed, the hydrated AquaBlok material can act as an effective physical, hydraulic, and chemical environmental barrier by its relatively cohesive and homogeneous character, low permeability to water, and chemically active (sorptive) nature. For many projects, AquaBlok use generally involves applying dry masses of the product through water and across the surface of contaminated sediments. In a matter of hours, a homogeneous and relatively cohesive, low-permeability cap, or barrier, is formed between contaminated sediments and the overlying water column and its inhabitants. Barrier thickness design and implementation will depend on a number of factors, including: type of formation, water depth and salinity, application thickness, number of lifts applied, and sediment characteristics. AquaBlok can also be used as a hydraulic/chemical barrier to the movements of water- or sediment- borne contaminants into underlying groundwater resources, or to minimize leaching losses of water from reservoirs or wastewater discharge basins. Effective management of contaminated sediments may involve remedial capping exclusively or an integration of capping with other management technologies like dredging and/or monitored natural recovery. In situ capping may also be integrated with in situ sediment treatment technologies to affect mass reduction of encapsulated contaminants. 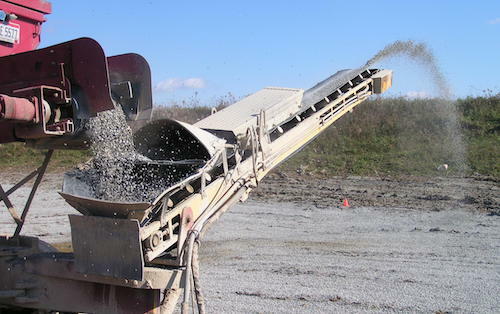 AquaBlok can be handled and installed using commonly available equipment and technologies, including conveyors, excavators, cranes with clamshell buckets, and even helicopters. Specialized equipment developed for sediment capping can also be used to effectively install AquaBlok sediment caps. The most appropriate installation method(s) will depend on a variety of factors including: water or shoreline access, bank slope, surface water characteristics and ecology, size of the project area, and relative costs. 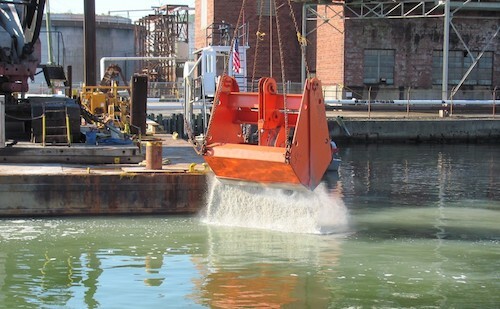 AquaBlok technology platform approaches to remediation can often result in lower overall project cost when considering site pre-cap dredging, material placement and tolerances, reduced mobilization costs, and reduced risk of remedy when compared to traditional dredge and ex-situ treatment. Costs for implementing an AquaBlok capping remedy will vary widely depending on a number of project- and site-related factors that will collectively dictate the most appropriate AquaBlok formulation, cap design, and method for cap installation. Project costs will also depend on whether material is packaged and transported to the project site or whether it is manufactured at or near the site. Costs associated with project planning and management; preliminary laboratory studies (if required); cap design; permitting; construction QC; long-term performance and monitoring; and cap maintenance should also be considered. If you think the AquaBlok composite particle system could be of use in your remediation projects, call us. We will be happy to discuss your project with you and help determine how the AquaBlok technology could integrate into a cost-effective solution.